The beer doesn’t get any fresher than the Darwin Brewing draughts served at LECOM Park, spring home of the Pittsburgh Pirates. In fact, the family-owned Darwin Brewing Company—across the street from LECOM Park, at 803 17th Avenue West—has been a favorite of Pirates spring-training fans since the brewery opened its present location in 2014. On tap for 2018: a new golden ale to mark 50 years of Pirates spring training in Bradenton. Also available on tap from Darwin at the ballpark: Circa 1926 (a wheat beer) and IPAs. Dedicated stands offer Southern Tier and Yuengling, while brews from the likes of Cigar City Brewing and Iron City are available as well. In most Grapefruit League parks you’ll find a mix of the hometown brews and local beers. At JetBlue Park, Boston Red Sox spring headquartrers, Massachusetts favorites Sam Adams Boston Lager, Rebel IPA, Sam 76 and Narragansett are on tap, as well as Florida faves like Yuengling and Fort Myers Brewing’s Gateway Gold. At Hammond Stadium, the Minnesota Twins’ spring home, you’ll find Summit and Fulton beers as well as a host of Florida beers from Bury Me Brewing, Fort Myers Brewing and Islamorada. At First Data Field, New York Mets fans will feel better after a Blue Point brew or two, served from a dedicated outfield stand. At Ed Smith Stadium, a left-field seating area with four tops and a dedicated beer stadium serves everyone’s brew needs. When it comes to beer in the Cactus League, one brewery has cornered the market on prime ballpark locations: Four Peaks. It’s hard not to run across a Four Peaks beer at spring training, but that’s exceedingly good news for you. There are Four Peaks beer gardens at Camelback Ranch-Glendale and Peoria Stadium (shown above), and every other Cactus League ballpark features Four Peaks on tap or in cans. We’re partial to the White Ale or a Peach Ale from the Tempe-based brewery, but many folks prefer the heavier Kilt Lifter. If you don’t get your fill at the ballpark, you can find it at one of the nicest—and busiest—brewpubs in the Valley: the original 8th Street brewery in Tempe. It’s an easy drive from Sloan Park, Scottsdale Stadium and Hohokam Stadium. Four Peaks Brewing, 1340 E. 8th St., #104, Tempe; 480/303-9967. Besides having Four Peaks brews available, most Cactus League ballpark offer other local beers on tap or in cans. In Goodyear Ballpark, you can find SanTan Devil’s Ale on tap, and you’re a close drive from a great brewpub in the form of Saddle Mountain Brewing Company (15651 W. Roosevelt St., Goodyear; 623/249-5520; saddlemountainbrewing.com). 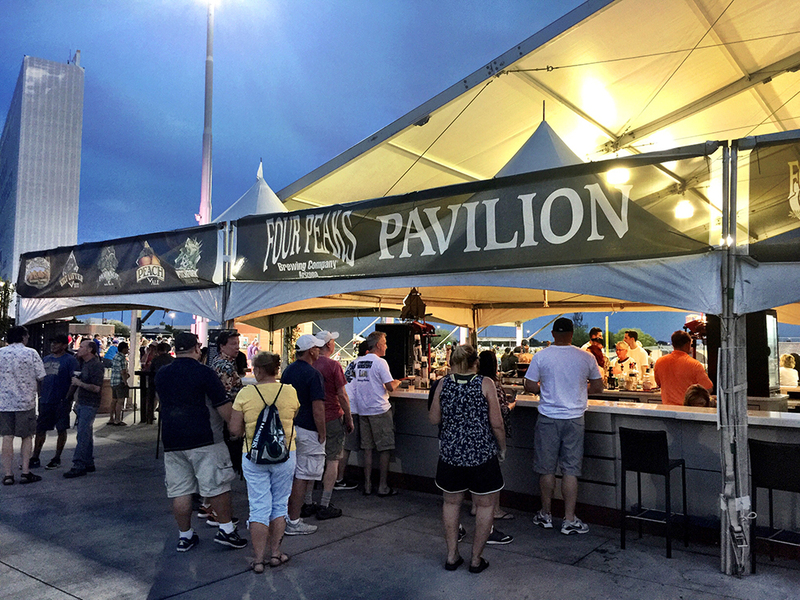 At Peoria Stadium, each end of the grandstand concessions features a microbrew stand tied to each team (the Seattle stand, for example, is the Belltown Brewpub), and the outfield concourse in past years featured a Red Hook brewery tent. And at Scottsdale Stadium, there’s a nice mix of Bay Area and national brands from the likes of Fat Tire, Anchor Steam and more. (In fact, there’s a booth devoted to local brewer Huss Brewing Co., despite the owner’s status as a Cubs fan.) If you’re a fan of Estrella Jalisco, it’s available in tallboys at Salt River Fields and on tap at Surprise Stadium. Finally, it wouldn’t be a spring training beer story if we didn’t highlight the availability of Old Style at Sloan Park, spring home of the Chicago Cubs. Here’s a little beer history for you, kids. In the olden days, before Anheuser-Busch brutally bought its way into Chicagoland and the Friendly Confines with the assistance of Harry Caray and WGN-TV, the Chicago beer scene was considerably more modest and pastoral, if you will. Interestingly, there was not much of a local brewing industry in Chicago at the time, and the quaffing needs of locals were served by Wisconsin breweries: Old Style out of La Crosse, Augsburger out of Monroe, and Miller, Blatz and Pabst out of Milwaukee. Old Style, from G. Heileman Brewing in La Crosse, was made the official beer of Wrigley Field in 1950 and became the favorite of a generation of Cubs fans. You can still find taverns in Chicago sporting Old Style, Augsburger and Blatz signs, and Old Style is still sold at Wrigley Field as well. (Bonus trivia: OId Style is also sold at Principal Park, home of the Iowa Cubs.) So before you settle into your seat at a sold-out Sloan Park, take a moment to track down an Old Style tallboy and tip your cap to a little bit of Cubbies history.